Garden manager Orin Martin gives students a lesson in what makes up the dirt beneath their feet. A display from a student-initiated project funded under Measure 43. This month marks the one-year anniversary of the passage of Measure 43, the student-funded Sustainable Food, Health, and Wellness Initiative at UC Santa Cruz that has treated thousands of students to a broad menu of ways to learn about food, including hands-on workshops, campus conferences, events, classes, and presentations by well-known food policy activists. In May 2010, students turned out in record numbers to support the measure that adds a $3.75 fee per student each quarter. CASFS administers the approximately $106,000 generated each year and underwrites the cost of classes, grants and programs that enhance students’ understanding of nutrition, farming and gardening, and the impacts of their food choices. "The fact that students decided to tax themselves in these difficult economic times so that they could learn more about sustainable food systems is remarkable. 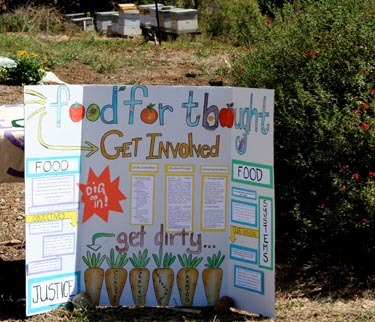 It demonstrates how hungry students are for knowledge and experience in food systems and how central sustainability is to UC Santa Cruz,” said Patricia Allen, director of CASFS. 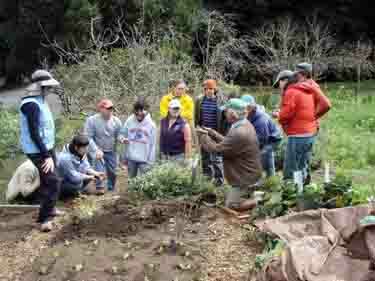 In its first year, Measure 43 supported a suite of hands-on learning opportunities at the CASFS/UCSC Farm and Alan Chadwick Garden. Students took part in a week-long intensive organic gardening class dubbed “Garden Cruz,” taught by CASFS Apprenticeship staff and graduates, as well as weekend classes on fruit tree care, seed starting, soil care, herbal and medicinal plants, and bee keeping. “I signed up for Garden Cruz because I wanted to learn how to grow my own food,” said Aliesha Balde, an environmental studies and economics major who spent her spring break week learning to garden. “What I learned was timeless,” she said. “These are skills I will have for the rest of my life." Along with gardening classes, Measure 43 helps fund the quarterly Food System Learning Journeys offered through the OPERS’ Recreation Program. Fall and winter journeys included a tour of the campus gardens, a bay area urban garden and farmer’s market excursion, seasonal cooking lessons, and a visit to Cabrillo’s new horticulture facilities. This spring, students learned to can and pickle fruits and vegetables from the owners of Happy Girl Kitchen, helped plant an organic garden at Wilder Ranch State Park, biked the coast on a “tasting tour” of local farms and farm stands, and visited the Old Town Salinas Farmers Market and the Agriculture and Land-Based Training Association (ALBA), whose farmers provide UCSC with local, organic product for the dining halls. For students interested in developing new research and campus activities, Measure 43 provides funds for nutrition, health, and garden- and farm-based learning projects. This winter more than $25,000 was distributed to UCSC undergraduates in the first year of what is slated to be an annual competitive grants process. The measure will support student garden projects at Stevenson College and Family Student Housing, a Chancellor’s Undergraduate Intern position with the Program in Community and Agroecology (PICA), an urban agriculture demonstration project at The Village, and a “Take Back the Tap” initiative to reduce the use of single-use plastic bottles on campus. Throughout the academic year, students can also apply for Measure 43 funding to support visiting speakers and researchers. This year that support brought Winona LaDuke and Robert Gottlieb to campus for public presentations and meetings with students. Duke is a well-known food system activist and former vice presidential candidate; Gottlieb recently co-authored the book Food Justice and is director of the Urban and Environmental Policy Institute (UEPI) at Occidental College in Los Angeles. The funding also supported classroom presentations by author Richard Oppenlander at the Education for Sustainable Living speaker series, as well as talks by CASFS staff in several courses at UCSC. Other projects funded by the measure include the annual Campus Food Guide and Campus Garden Guide. More than 15,000 copies of the publications are distributed across campus each year and are part of the packets of all incoming residential students, introducing the student community to the classes, internships, and other opportunities to get involved in the campus and community gardens and food system. In the coming year, Whitman and other student leaders will work with Galarneau to promote more sponsorship and grant opportunities for students to develop their own projects and bring speakers to campus, along with more hands-on classes and Food Systems Learning Journeys.